Bernie Carbo was the 1970s. He played tiny parts of both bordering decades, but poorly and sparingly, as if to show that he didn’t belong anywhere but in the era of mustaches and waiting and going around. He won the National League Rookie of the Year with the Cincinnati Reds in 1970, and he smacked the last of his 96 regular season home runs in 1979, with the St. Louis Cardinals. When drug scandals tore through baseball in the mid-1980s, Bernie Carbo’s name resurfaced in the role of a fall guy. According to a recent Boston Globe article in which Bernie Carbo spoke at length about abusing drugs and alcohol during his playing career, Carbo was mentioned by Keith Hernandez at a federal drug distribution trial as the man who introduced Hernandez to cocaine. The decade that ended in blow began in a better place. According to Joe Posnanski’s great book on the 1975 Reds, The Machine, Carbo’s first major league manager, Sparky Anderson, had managed Carbo in the minors, and something about the young player, something more than just his prodigious talent, tugged at Anderson’s heart in a way that he had never experience before or ever would experience again. In his Hall of Fame career, Anderson managed some of the greatest players to ever grace a baseball field and won World Series titles in Cincinnati and Detroit. He held one player above them all. “I never loved a player more than I loved Bernie Carbo,” Sparky Anderson said. In the 1970s, certain questions were going around. For example: How long does love last? Bernie Carbo didn’t last long in Cincinnati. Sparky Anderson, who had tried so hard to keep him on the straight and narrow, finally lost patience with the young player’s inability to focus on the game, and the outfielder was shipped to St. Louis in 1972. He didn’t last long in St. Louis, either. 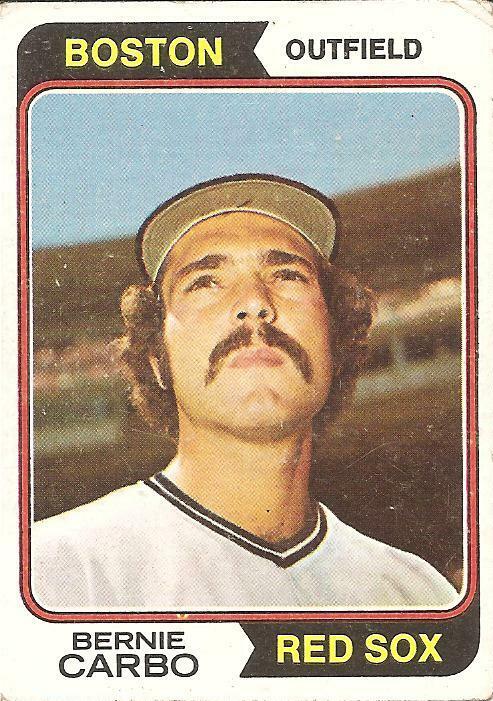 The Topps photographer dispatched in 1973 to get his photo for the 1974 set must have sensed that Bernie Carbo was not the kind of guy capable of putting down deep roots. Bernie Carbo complied, but with an expression that suggested that he had some understanding that his image was being captured not to be heroic but in such a way that it could be used whether he lasted long in St. Louis or went elsewhere. The team insignia on the crown of his cap would be obscured. He could be anywhere. He could be nowhere. He looked into a cloudless sky. His mustache seemed provisional, as if it may have been assembled with a mail order kit. You could easily imagine him later, sitting on a bench by his locker, holding one half of the mustache in his hands while the other half still clung to his lip. Am I this guy or that guy? Am I here or gone? I got this 1974 card of Bernie Carbo when I was six. My family, minus my father, moved from New Jersey to Vermont that year, my first year in a new place, and my first year of baseball cards, though I just got a few. I went to my first game the following year and got hooked. I remember cheering for Yaz and being in awe of Reggie Jackson. I don’t remember much else, but I can piece together, with the help of baseball-reference.com, that my love for Bernie Carbo started that day, in the ninth inning, the Red Sox down to one last chance and calling on Bernie Carbo to pinch hit. I would have known the name from my 1974 card. I would have loved him from the moment he appeared on the field with all our hopes resting on his shoulders. I would have cheered for him with all I had left of my ragged voice. And when Bernie Carbo struck out, I would have felt a hit to the gut. The tangling of love and pain was going around. In other words, from that moment on, Bernie Carbo was mine. That’s how I felt. Carl Yastrzemski was my favorite player, the one Cardboard God I actually tried to make contact with by sending him a letter, but I understood that he belonged to everyone, a superstar who had always been there. Bernie Carbo, on the other hand, didn’t always start, and hadn’t always been there. He shuttled from place to place. He appeared and then disappeared and then reappeared and then disappeared, twice being traded to the Red Sox, twice being tossed away. I understand now that his was a life of uncertainty and waiting. Back then, when I was a kid, I only knew that he was at the edge of the galaxy of stars that was the 1970s Red Sox, and that unlike Yaz or Fisk or Lynn or Rice he needed my love to exist. I also know now that I was far from the only fan who felt this way—as Sparky Anderson could attest, there was just something about Bernie Carbo that you wanted to love—but back then I believed that without my attention Bernie Carbo would disappear. I always thought of him as a small guy, but he was actually bigger than Yaz. It was easy to build misperceptions of players when you hardly ever saw them. I only had the cards to go on, and the name. Something about how the name ended in “ie” made him seem little, either a kid himself or a creation made especially for kids. Like R2D2. Like Herbie the Love Bug. I knew him most of all from a picture of him from the 1975 World Series. He was rounding the bases after his famous pinch-hit home run, and he had his arms out, as if he was flying. I took the picture at face value, as if he had while rounding the bases decided that the feeling of tying up an elimination game of the World Series, of staving off his team’s doom, was so good that he was going to put his arms out like an airplane and pretend to fly and maybe even lift right off the ground and fly for real. Flying was going around. This seemed to be paired with the spiritual atomization of the times. It was no longer so easy to simply believe what everyone who had come before you believed. You could believe anything. You could believe nothing. Richard Bach scored two huge best-selling books in the decade by pairing an easily digestible version of Eastern mysticism with book-length metaphors of flying. In one, the protagonist was a nonconformist seagull. In the other, Illusions, a man who traveled the country giving rides in his prop airplane was the mouthpiece for the idea that everything you could ever see or touch or even love was a mirage. Nowadays, disclosures and confessions and repentance are going around. Back then I was high, but now I’m grounded. I once was lost, but now I’m found. The past is impure, something to apologize for or legislate against or brand with an asterisk as unclean, unreal. The past is something to survive. Bernie Carbo is still going around. This is no little surprise, all things considered. His life story bears some resemblance to that of some other 1970s baseball players who did not fare so well, such as Darrel Porter or The Sundown Kid. I’m glad he made it through. I’m glad he survived. The chatter after his revelations in the Globe has been and will be that he was just another waste case of the 1970s. When you see him in the old footage rounding the bases, saving the day, which mirage will you see? Will you see only the basis for a public apology, the product of this thin era of regret, or will you see the product of an earlier time: a fallible hero worthy of love? You are currently browsing the archives for the Bernie Carbo (Bos.) category.